If you’re looking to upgrade the appearance of your motor, Auto Medics recommend diamond cutting alloys for high impact results. As with any investment, making the decision requires careful consideration but we guarantee the end result will have your wheels turning heads. Before you go ahead and give your wheels the ultimate makeover remember that expertise is essential and to only hire a professional to undertake diamond cutting. Auto Medics are one of the few garages in the High Wycombe area qualified to carry out diamond cutting alloys. If you find someone that seems too good to be true, check out their credentials; diamond cutting is a very complicated process, with high risk of wheel damage if carried out by someone not highly skilled in performing such services. Our highly skilled mechanics will diamond cut alloys using a specialist lathe with diamond cutting tip, then we expertly remove thin layers from the alloy to form a distinctive diamond cut appearance. To remain in pristine condition diamond cut wheels need to be well maintained to ensure their look lasts longer. Experts like our team at Auto Medics will inform you of the steps you need to take to keep them looking their best. Diamond cutting doesn’t have to be a one-time service BUT the structure and integrity of a specific wheel needs to be determined by an expert to establish whether it’s safe to undergo diamond cutting again. Auto Medics have been commended by many customers on the professional, faultless diamond cutting services. 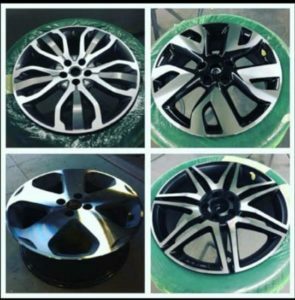 Our experienced technicians produce excellent results when undertaking alloy wheel refurbishment and diamond cutting jobs. So if you’re looking for diamond cut alloys, our friendly team at Auto Medics – the car body repair shop in High Wycombe – guarantee to deliver the new look you want for your motor. Call 01494 533 534 for more information.